On Saturday I had the privilege of meeting with Judi Dewitt, Master Bobbin Lace maker. I was able to meet her and her husband, Clyde Dewitt, at the Fort Edwards Foundation where both are board members. I met Judi five years ago at the Fort Edwards Family Frontier Day, and was impressed with her skill and the enthusiasm she conveys in demonstrating this rare skill. 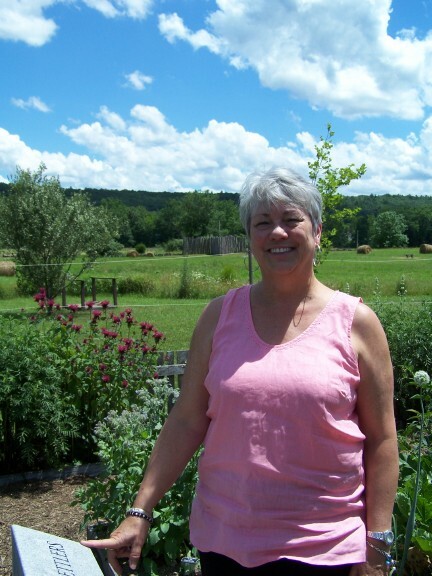 Judi has received recognition from Tamarack, located in Beckley, West Virginia. I interviewed her about lace making over lunch. Culver – What inspired you to learn bobbin lace making? Dewitt – I was at an Irish Fair at Wolf Trap in Virginia and saw a woman making lace which was beautiful. I thought I could teach myself how to make lace, but life got in the way. I still had children at home, and I was working, so there was not much time for my hobbies. Fast forward five or so years. I was living in Remington, Virginia and in a local flyer was an advertisement for a woman teaching bobbin lace in Remington. I was dating my husband and we both signed up for classes. Culver – How long did it take for you to learn bobbin lace? Dewitt – This is a difficult question! I was in a class of six students including my husband. We met every Monday night for 1 1/2 hours. We started by learning how to make the “stitches” which are made by crossing or twisting threads. There are three “stitches” – the half stitch, whole stitch and whole stitch twist. The braiding (plaiting) stitch is made by doing the whole stitch over and over again. We learned how to start and end a piece. The best project to learn on is a bookmark. We made many of these. Then we moved on to more complex designs. We took lessons for about six years. Then we moved to West Virginia. Culver – How long have you been demonstrating your art at Fort Edwards? Dewitt – It has been about five years. We did our first demonstrations at the craft co-op at the Barn in Lost River, WV and have demonstrated in several places. Culver – How was lace produced in Colonial America? Dewitt – The way I make lace is the same way the colonial women made it – with a pillow of straw, pins, and bobbins. Lace was being made during “our” time frame at Fort Edwards, so my husband and I can demonstrate lace making the way lace was made in the 1700’s. Our equipment is all modern design but the techniques are the same. We have a pillow made with a high density foam and covered with a cloth to protect it. In the old days, the pillow was stuffed tightly with straw. The firmness holds the pins in place. We use brass pins because they do not rust. 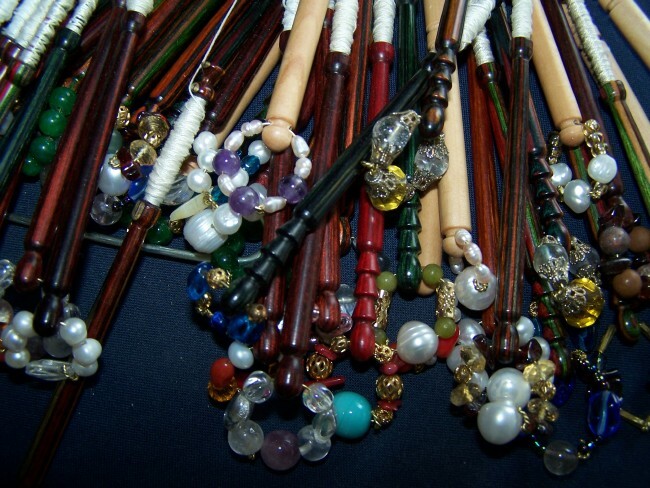 My bobbins are made of wood and spangled with beads for weight and to keep them from rolling. Dewitt – Different laces are made with different angles. For example, Torchon lace is made with 90 degree angles. Flanders lace is worked on a grid with 45 degree angles, and Bucks Point uses a 60 degree grid. Culver – How long does it take to make lace? Dewitt – On average, it takes about an hour to make an inch of lace, sometimes more if the pattern is complicated. The lace Christmas ornaments that I am making for Tamarack are about four inches and they take several hours, usually about five hours. More time is needed when the pattern is complex. Culver – Do you have any of your lace on your cloths? Dewitt – The only place I have any lace on my reenactor clothes is on my historically correct cap that I wear at Fort Edwards. I would love to make flounces to go on dresses and jackets. Culver – Have you ever considered writing a book teaching the basic skills to make lace? Dewitt – No, this is something to think about. Culver – What is your background in the arts? Dewitt – I have been an artist ever since I can remember. I have drawn with pencil, pen and ink, I paint in oils and watercolors and am a published illustrator. I am a knitter, crocheter, love to sew and quilt. Since moving to West Virginia I have learned to rug hook. I design and hook my own rugs. My next big adventure is to dye my own wool. I also love doing cross stitch. For opening day at Fort Edwards next year I am going to design a cross-stitch pattern and teach the children the techniques of this embroidery. Culver – You must be busy! With all these skills of yours, why do you continue to make lace? Dewitt – There are so many pretty designs to make. I have several books filled with beautiful edgings for pillow cases, towels and clothing. I have three grown sons and one day they asked me why I don’t just buy lace…I told them I make it because I enjoy it. I work with simple thread, brass pins, bobbins, a pillow and a design and make something truly beautiful. I am part of a group that is keeping an ancient craft alive. I never run out of ideas or things to do. I just get tired and need a nap so that I can continue making pretty things. 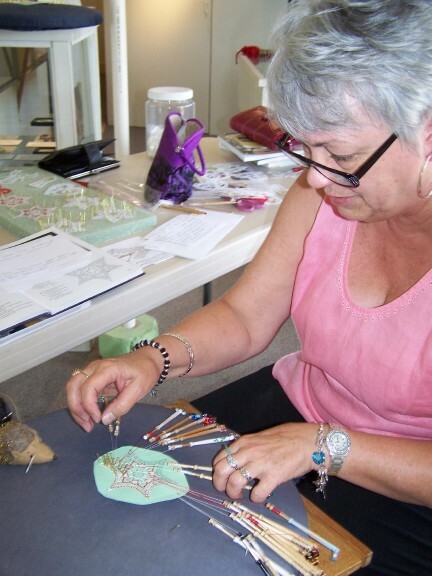 Judi will be teaching a bobbin lace making workshop at Fort Edwards on September 28, 2013. She also provides private instruction, and prefers teaching only one student at a time so that the student will have her undivided attention. I can personally attest that Judi is a superior teacher with a true love of the skill and the ability to convey it to others. Judi’s ornaments can be purchased at Tamarack, and she also accepts commissions. She can be contacted by emailing her at jadewitt@hughes.net. Edit to add: Emily Estrad shows amazing examples of bobbin lace in her fibretown podcast http://www.fibretown.blogspot.com/2013/07/episode-23-bobbin-lace-mind-blown.html Make sure you watch it to see the bobbin lace fan, clutch, necklace and amazing shawl, while must have miles of silk thread in it! 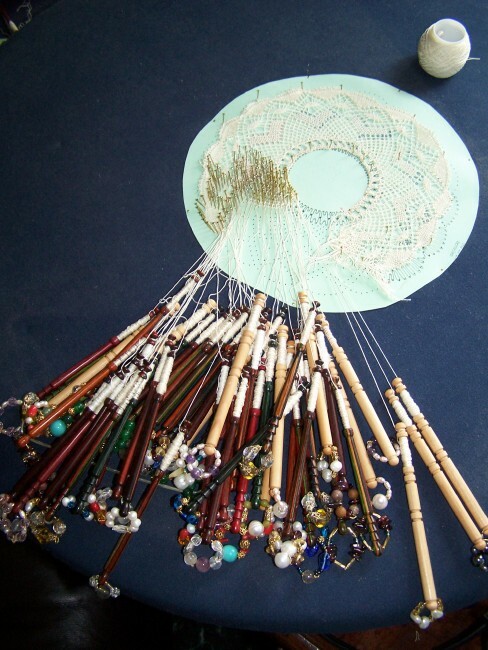 Here is a rare opportunity to learn the almost obsolete skill of bobbin lace making! The Fort Edwards Foundation in Capon Bridge is offering a lace making workshop on September 28, 2013 with lace-making experts Judi and Clyde DeWitt. Details about the instructors and photographs for the workshop can be found at the link provided. 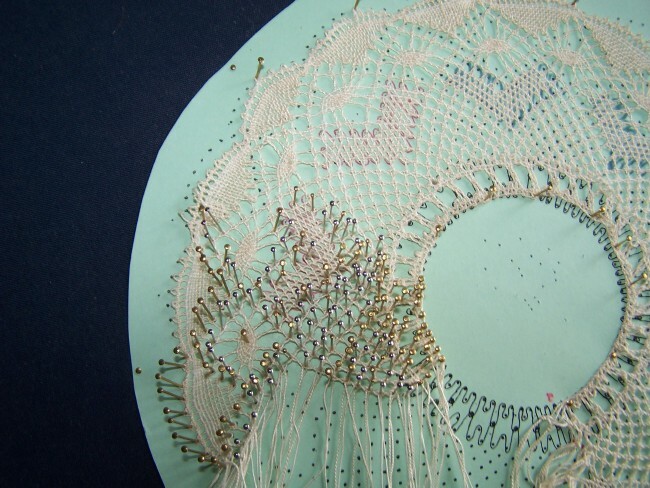 Bobbin lace can be traced back to Elizabethan England and beyond. 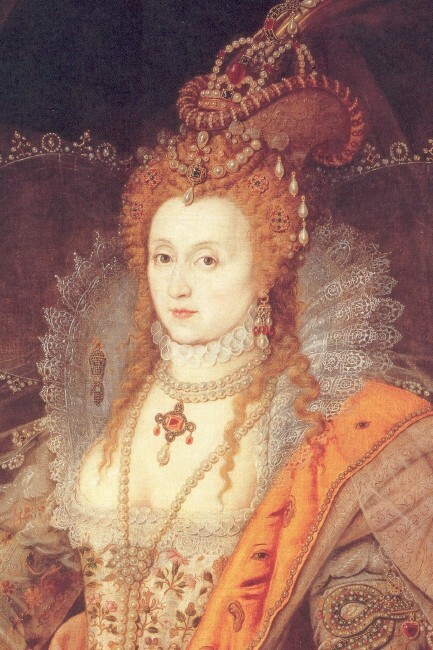 The ruffs or collars of opulent lace that are synonymous with the period were all made with wooden bobbins wound with thread and crossed into stitches creating intricate patterns. These pieces of lace are time-consuming to make and were very expensive. The bobbins come in various shapes and sizes and are usually “spangled” which means beaded. The rings of beads keep the bobbins from rolling around and getting tangled on the lace making surface, which is usually a “pillow” a large round surface that will hold the pins in place. Here is a close-up of spangled bobbins. If you live locally, please look into this workshop and the others that will be offered by the Fort Edwards Foundation, helping to keep history and these skills alive. I hope to have Judi DeWitt as a guest on this blog in the future for information on how to get started making bobbin lace for those who are not in the area. July 8, 2013 update: Please go Emily Estrada’s podcast http://www.fibretown.blogspot.com/2013/07/episode-23-bobbin-lace-mind-blown.html to see some amazing examples of bobbin lace!